I was talking about this with Ryan Macklin last night and I had a moment of "huh, I should write this down" so here it is. At Pax East, I ran a game of what can probably best be described as tabletop Final Fantasy Tactics. Early in the con I had run a game of Cortex+ D&D that had gone well, but I'd been struck by a desire to hack it further, and the end result is something that you can still see the Cortex+ roots in, but is kind of its own beast. 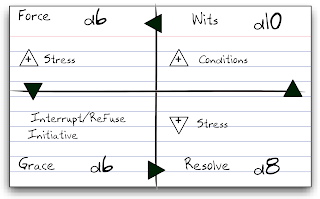 One of the essential rules of this design was that everything could be done on index cards (or post-its), and the character "sheet" ended up being a set of cards, one for stats, one (eventually 2) for class, one for distinctions and one for equipment. The actual dice values are, I hope, fairly self explanatory. When taking forceful action, this guy rolls a d6. Pretty simple. Now, before I get into the details of this, let me provide a little data on how play worked for context. Initiative was based on the Marvel model that Fred came up with, and on your go, you took an action and chose which stat you would use as part of the roll. Once that happened, that was the mode you operated in until your next action, which was relevant for defense rolls, and which had tactical implications that I'll explain in a minute. The important thing is that you got locked into that mode. Now, the other details: The black arrows represented advantage, so Force had an advantage over Grace, which had an advantage over Resolve and so on. The mechanical upshot of this was simple - in a conflict, the stat with the advantage would step up one. Thus, if this guy used Force against someone else using Grace, his D6 would be bumped up to a d8. This is not a huge bonus, but it offers an additional incentive to stat choice beyond "The best one". Resolve: Step down a stress or condition die on you. Grace: You may interrupt initiative to take action or refuse to accept to take your turn (unless the other part is also using grace and has a bigger die). So, that makes the choices pretty straightforward. But what about the GM? You definitely don't want to keep track of all that. And so you don't - these are PC rules. For enemies, life's much simpler. 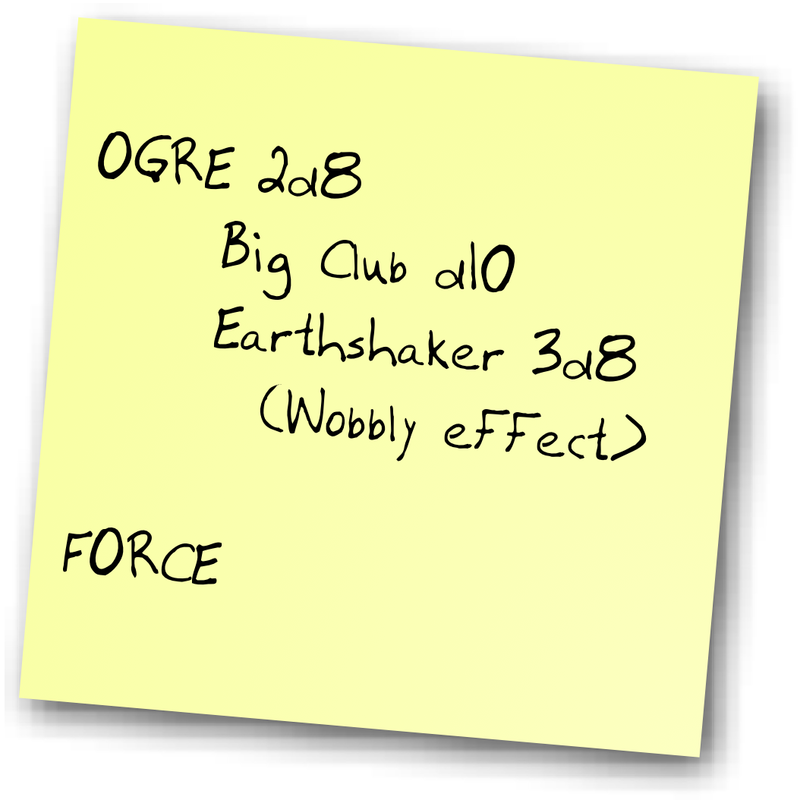 Just a few notes for a die pool, a special attack (If he used the earthshaker dice, he didn't do damage, but imposed the wobbly condition) and a note that he was a force creature, which suggested what he was strong or weak against. 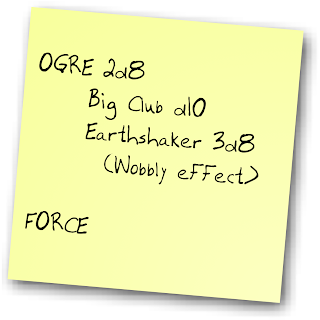 Simpler monsters didn't have a stat at all, and boss monsters might have two that they can switch between. Easy on the GM, but creates a broader landscape of choices (especially when there's a range of enemy stats - do you want to use wits on the ogre knowing that there's a RESOLVE Troll on the board?). Anyway, there was more stuff with classes and gear, but I figured I'd start with the basics. 2 - This worked startlingly well. 3 - In the future I might consider making this hidden information for the video-gamey reason of offering an avenue (SCAN) to finding this out. But that might also be too much work. I'm going to be following this with interest as I'll be looking at converting a campaign over into some Cortex+ variant. I'm curious how much the Grace Interrupt option saw use with the group and what sort of situations they found it useful for. So basically, you just made the easiest version of D&D available that is easy to teach, portable and retains tactical complexity. Nice one, Rob. Well, that's just full of Cool. Hmmm. This is awesome. I got into tabletop RPGs on Final Fantasy RPG 3e, so it's interesting to see a fresh, awesome take on the genre. I really like this a lot. If you ever plan a G+ Hangout using them, let everyone know. And, you are now "followed" good sir. I love the MHR system, and this is just a nice twist of lime on top of it. That is just a really cool mechanic (the advantage). I think it would work very well in play. @Craig Grace was really interesting because when I came to the table, I originally was making it more like super speed in marvel, and allowing it to interrupt with the expenditure of a PP. The problem is, that made it WAY worse than the other stats, so I changed it on the fly. At first, I was worried I had overcompensated, but in practice, it played out really well on two levels. First, for sheer practical use, it absolutely got used for interrupts, usually for heroic defenses. While they weren't technically interrupts, they felt that way, since it was often quite clear who was going to get target by who (based on stats and situation) so taking the opportunity to "jump in front of" the big bad and take control of the initiative handoff felt very potent and heroic. Being able to refuse initiative also worked well, but that was more tactical and less heroic - going grace meant it was hard to force your hand. But it also had a really interesting impact on Stat choice because the choice of Grace was so much part of the interplay of other choices, it felt very powerful, but because it was so different form the other choices, you very strongly felt what you were giving up. Net result was surprisingly satisfying. Nice. 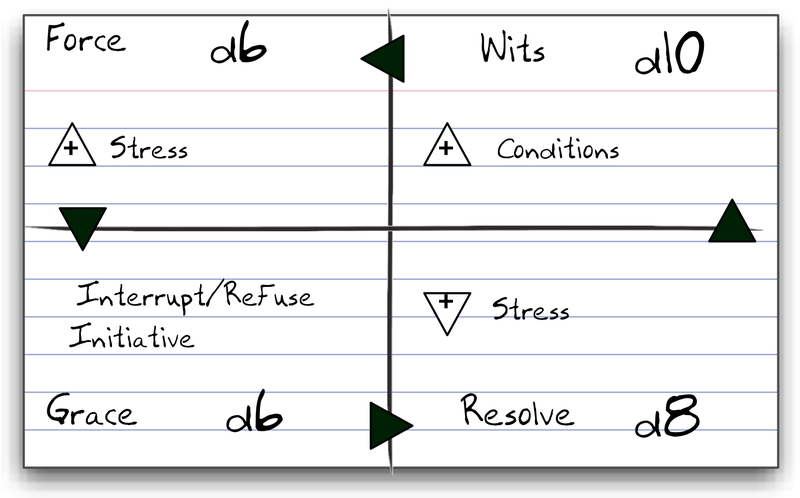 The circular advantage mechanism on character state is particularly nice. Also, I can't wait to see more of this - I want to see how classes and equipment worked out. Basically, I want to see enough information that I could take it to my group as a filler game of sorts when we don't have all our DFRPG people. Or take it back to the FFRPG people and see what they think of it. This is really cool! I hope you compile it into a quick PDF or something, I'd love to run it out here in Portland. I'd be so into that. Index Card Tactics Night at Guardian! I know this is a somewhat stale thread, but the four Values actually might make very nice Milestones in a different context.